Litha or Summer Solstice is celebrated on or around June 21st depending upon the Earth’s rotation around the Sun. The astrological date is Sun 0° Cancer. On the Wheel of the Year Litha the longest day of the year, is directly across from Yule the shortest day of the year. Litha has been celebrated as the triumph of light since ancient times with joyous rituals that celebrate the warmth of the Sun and Earth in high summer. It is a celebration of passion and of ensuring the success of the crops. The Goddess is heavy with pregnancy as is the earth. The Sun King is at the height of His power. High Summer’s revelry is tinged with a bit of sadness, for we realize that from this point onward the Sun will begin its slide into darkness. In our Wiccan celebrations the Oak King, who represents the waxing year and rules from Yule to Litha is triumphed over by his brother, the Holly King who rules from Litha to Yule, representing the waning year. The defeated Oak King retires to the Underworld to rest and gain strength. The power of the Sun at Solstice is protective, healing, empowering, revitalizing and inspiring. It adds a powerful charge to all spells, crystals and herbs. Divination is also a traditional pastime at Litha. Practice Magick concerning abundance, fertility, the riches of Nature and communication with Nature Spirits. 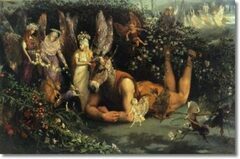 Midsummer is one of the most magickal times of the year and faerie folk are very active, playing pranks and trying to steal away young and beautiful humans to join them in the Hollow Hills. Litha is a crossover point (which faeries love) with the sun standing still before it begins to slip backwards towards Yule. At Litha there is an abundance of flowers, the days are long and warm and the natural world is sensuously inviting. Faeries love the roses that bloom at mid-summer and by adding rose petals to your bath you may ask the Fey to help you attract love. Brew a rose bud tea and drink it to increase your psychic powers. At Midsummer you are more likely to see Water Nymphs near streams and ponds or undines near the seashore. Water Faeries are said to be the most numerous of all spirits because it may be easier for Faeries to manifest where the air is damp. Where there is water, there also may be a window between the worlds, for water has many mysterious properties. What other Element can reflect images of the physical world? 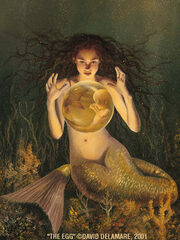 Yet you may also look through water, into a different realm filled with beings that may not live within our world. Don’t forget to leave offerings to the Faerie Folk on this special night. Milk, wine and honey mead are enjoyed by Faeries. You may also leave a small bowl of fresh water for them to wash their babies in. If you grow fruit or vegetables leave some on the ground or on the tree or bush as an offering. 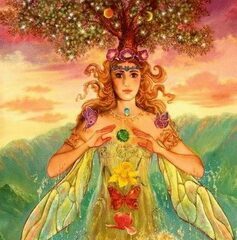 Not only are you honouring the Fey by doing this you are also honouring Mother Gaia by returning some of Her gifts as a token of respect. Litha bonfires possess great power and it is believed that jumping over one will bring prosperity and protection. Courting couples join hands and jump over the embers to bring about a long and happy marriage, prosperity and many children. Charred embers from the bonfire are very magickal and if placed around gardens and orchards will protect the crops and ensure an abundant harvest. Embers are also charms against injury and bad weather at harvest time. Decking homes with birch, fennel, St. John’s Wort and white lilies brings blessings and protection. The mystical art of divination by eggs dates back to ancient times, and nearly every culture has practised it in one form or another. Our Norwegian Sister Freya brought this form of divination to the Coven many years ago and we’ve had wonderful results! On the night before Midsummer (Litha) fill a clear glass with water then break and egg and add the egg white to the water. Set the glass on your bedside table or in a window overnight. The next morning look at the patterns formed by the albumen and divine their meaning. It is a hot, breathless Midsummer night. To the West the sky is bathed in brilliant hues of orange, red and amber. In the East stars are emerging, twinkling against the purple sky. You are facing South toward a line of hills, and are standing o at the bottom of one of the highest. On the hilltops you see that pyramid-type structures have been erected, and you realize these are beacons – enormous bonfires waiting to be ignited. The air seems electric and, nestling within the undergrowth at your feet, you can see thousands of tiny, glimmering glow-worms, like stars come to earth. In the distance to the left, a shout goes up and one of the beacons flares into life. Another flames in response, and another and another until the hilltops stretch into the sunset, blazing in salute to the sky. You realize that you must get closer to all this drama, and so you climb the hill. The air is warm, and although the breeze freshens as you climb, soon the fierce breath of the bonfire envelops you. You feel apprehensive, but you are nearly at the top, almost part of the chain of flame that stretches through the midsummer night. As you arrive on the hilltop plateau, facing the conflagration, you expect to see the other humans responsible for lighting the beacon, but there is no one there to be seen. Mesmerized, you stare into the flames. Within the bonfire all is fluid, incandescent. There are tunnels of flame, walls of flame, turrets of flame –cities and civilizations seem to come into being and pass away, in the twinkling of an eye. Soon you see forms: here is a serpent, coiling and twisting; there a dragon, raising its great head; over there a column of wild horses tossing their fiery manes. Faces come and go, too, laughing, grimacing, and staring. You feel as if you are being given a view of another wold, a world of pure energy. Suddenly a shower of sparks erupts from the bonfire and falls around you. These sparks do not dwindle – they grow. You step back, fearing the grass has caught fire, but realize this is a different sort of flame. The grass is not being consumed, and the flames hop and dart from place to place. You watch as each individual spark grows into a capering sprite, made from pure flame. Quick as a flash one of them flies your way. Too late you shrink back, fearing to be burnt. But the sprite flickers around your face and neck and all you feel is a pleasant sense of tickling. You hear a chorus of merry laughter as the sprite leaves you, to dance again with his fellows. You smile too, and begin to relax. Now another spark issues from the fire, falls to the ground before you and grows into a mighty Djinn, taller than you are. Talk to this being. Ask questions, speak of your fears (if you have any) and tell especially of your hopes and dreams, your ambitions and desires. Listen to all the Djinn has to say. You may hear him as a rushing in your ears, or experience him as a feeling of excitement in your heart. Do not be surprised if you suddenly realize you want things you never knew of, or feel drawn to attempt something exceptional. The Djinn can awaken in you powers you never knew you had. Dance with the Djinn, if he wishes, play and laugh. Know that all things are possible and that the Universe is far, far more mysterious and wonderful than you ever supposed. The time has now come to take your leave so do so respectfully and with thanks. As you make your way back down the darkened hillside, the salamanders light your way, skipping and shimmering, until you walk through the shadows and find yourself back in everyday awareness.